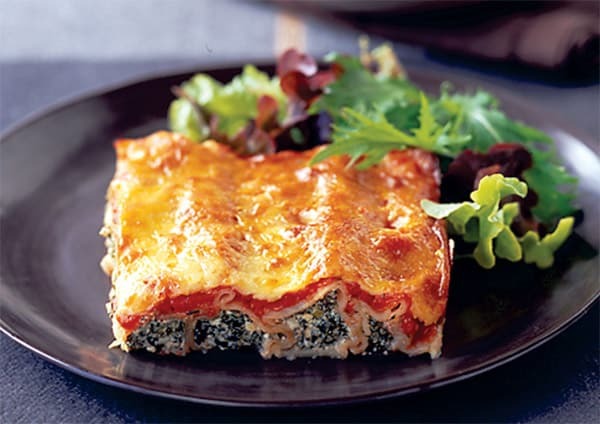 It’s amazing how simple cannelloni can taste so wonderful when combined with creamy ricotta cheese, spinach, and egg. Due to its amazing health benefits, spinach is always a good choice to prepare but when it comes along with crispy cannelloni, you’ve got yourself a delicious meal even your little ones will enjoy. Spread one cup tomato sauce over base of baking dish. Arrange cannelloni in single layer. Pour over remaining sauce and sprinkle with one tablespoon of parmesan and mixed herbs. Bake in pre heated oven at 200C for 35-40 minutes. Variation: Substitute one tub of ricotta for 185 gms Safcol silver salmon.